“I don’t think you should get your hopes up for this wedding dress trip, Mrs. Hummel, because I have two sisters just like you and I’ve gone shopping with them both before. I don’t think there is anything fun about it. You’re probably going to be really disappointed.” – a nine-year-old boy in my piano studio. My first Sabbath of Lent started off with a sudden burst of tears. While I scrambled eggs before church, Aaron showed me a meteorologist’s report indicating a big snowstorm for the end of the week, and said I should prepare myself to make a hard decision about my weekend plans: driving (solo) to Michigan for a special day of wedding dress shopping for my sister Bethany, who is getting married in July. I knew Midwestern road trips in February were never a sure thing when I put this on my calendar, but facing the reality of a predicted blizzard in an area not known for decent road conditions was entirely disheartening. Almost everyone I know heard my tale of woe during the week, and many faithfully prayed this trip would work out for me. With three sibling weddings coming up this summer, extra time to visit and prepare for the big day(s) are a luxury, so it is likely this dress shopping trip would be my only time to celebrate with Beth before her nuptials. This was it! The trip HAD to happen! And then my prayers were mercifully answered with a very light snowstorm so I could travel safely. This probably came at the expense of children all over my county who hoped and prayed for a snow day from school. I hurried through the local library and grabbed some random audio CDs off the shelf to keep me company on the road. I listened to Battle Hymn of the Tiger Mother by Amy Chua during my drive. I cried when she spoke of her sister’s cancer diagnosis, and it made me so glad I was going to spend this weekend with my own sisters. After I arrived and recovered from the car time, my mom and all three of us girls spent a long Saturday shopping for a wedding gown. We watched Beth start off nervous and quiet, (probably overwhelmed by thousands of yards of lace, satin, taffeta, ruffles, ruching, sparkles, and appliques) transforming through the day into a confident, comfortable, well-spoken Bride – with the perfect dress to match! I wiped a few tears when she first wore it. Grandma had to stay home nursing an injured knee cap, so we took secret forbidden iPhone pictures for her. 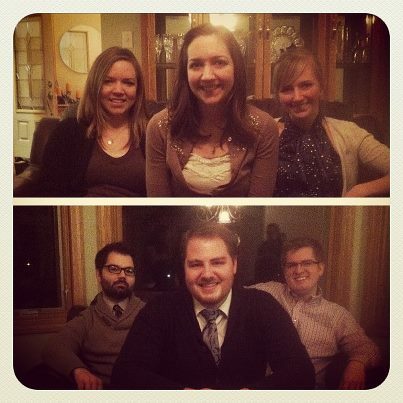 After all this hoopla, we ended our Saturday with a party celebrating the engagement with both sides of the new family. Now that she’s engaged to Isaac, Beth is marrying into a family of our old home-school friends. (Aaron and I even went to college with the oldest brother and his wife.) During the past ten years of friendship we’ve all known we would somehow become related, since “they have boys and we have girls,” and we have called ourselves “The Vander Ports,” a combination of our last names, for years during our movie nights and beach parties. For a while it wasn’t clear where the romantic connection would eventually happen to bring brother-sister friendships into an official capacity, but Beth and Isaac are finally making good friends into a big extended family. We made plans for the wedding and swapped stories, laughing until we cried on more than one occasion. The Vander Ports (minus Caleb) — best wedding party ever! Then I cried a bit when I had to leave on Sunday morning. We chose to move forward with Aaron’s PhD knowing that this career was not ever going to bring us back to the same towns (or state, probably) as our families, but it’s really draining that the current distance requires such sacrifices to get back and forth. During that long trip back, I listened to A Mighty Heart by Mariane Pearl, and I sniffled along with her tale of love and sacrifice, losing her husband Danny at the hands of Islamic terrorists in Pakistan. My story isn’t the same as hers, but she hit me hard; I was very ready to be home and celebrate that my husband was alive. When I arrived, I found Aaron working on a project in the garage. 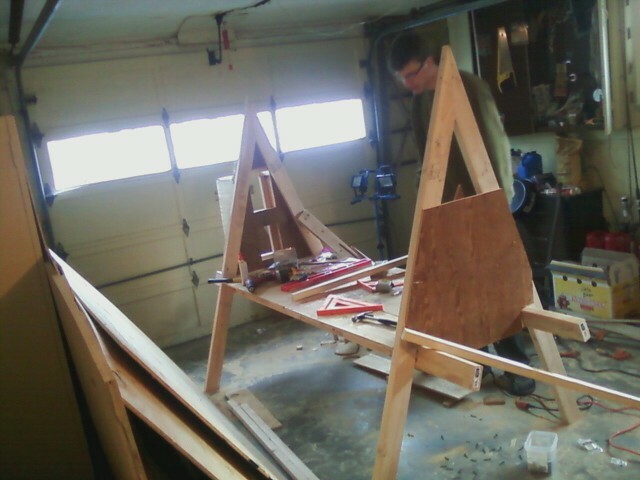 He says it is an A-frame playhouse for our future kids. I think it looks suspiciously like a chicken coop, which he recently mentioned was legal in our neighborhood. You are the sweetest 🙂 I’m so happy you were here to celebrate and shop this weekend. Best. Matron of honor. Ever. Thanks… 🙂 I’m so glad I could, too! What a cute “play-house”! I am so glad to see Aaron preparing for the next important job in his life! And I was even gladder to have you stay with us while he started the project! Haha… I think our future chickens will have lots of fun in their A-frame “play coop”! 😉 Too bad he missed out on all the fun in MI! That tiger mom is CRAZY… but I got super fascinated with the book and could not put it down. What I decided was that i will not mother like she did…. which means my kids won’t perform in Carnegie hall at a young age. Whatever. Yeah, I was almost ready to start saying piano lessons were bad if they led to things like that…. then I decided wacky selfish un-gospel-saturated parenting was the problem. The whole book was basically the author stating, “I’m selfish and I want attention!!!!! !” She’s the one who needed to grow up, not her kids. And all that “Chinese kids are better” crap? Does she know what the suicide rates are for young asian women? You can’t pretend like that is healthy.